Investing is often referred to as an art form. Models, charts, and regressions can only get you so far. We are constantly pummeled with an endless stream of data, some of which is important information and some of which is worthless noise. Drawing order out of this chaos requires one to engage with his/her uniquely human element, one’s creative capacity. How well one can paint a picture with the incoming data will likely determine his/her success. Are we getting some of those important data points now? Given the recent moves across a series of markets, it sure seems like it. When it comes to art, my personal preference is Romanticism. Romantic paintings are clean, vibrant, clear, and notably optimistic. They reflect a stylized view of the world. Life as it could and ought to be, not how it is. The romantic artist’s message should be relatively obvious to the observer (with some room for differing interpretations). Much to my dismay, this is not the art form that investing resembles. I find it closer to Impressionism. Impressionism is an art movement that originated in the late 19th century. In a departure from preceding styles, impressionist painters abandoned precision when it came to brush strokes and color choices, and instead took a more free-form approach to their craft. While the impressionist’s message can certainly be understood, it requires a bit more abstracting in order to do so. The pictures are not quite as clear; it helps to take a few steps back while observing. Perhaps the most well-known of the lot is Claude Monet. One must approach the investment markets like he/she would a Monet. We’re typically only privy to fleeting glimpses of what’s going on in real time. It is only on an ex post basis where market movements make sense. With the benefit of hindsight, the seemingly sloppy brushstrokes of price changes can be properly contextualized to form the clear chain of cause and effect that underpinned that which just occurred. Yet, as investors, this is just our task. To interpret the world in terms of capital flows and price, and race to solve the puzzle before too many others catch on; at least for that brief period of time before the playing field changes once again. With so much data our disposal, more than any human or machine could possibly process, how is one to succeed? Herein lies the art. And volatility return to volatility, to name a few. The question we investors must ask is whether these market moves are discrete events – each with its own specific set of drivers – or might they be related, interconnected by some unverified, underlying theme? This is no easy task, as validation will only come in the ensuing years. In my view, each of the significant market events in recent history has stemmed from – what I call – a levered investment thesis gone wrong. I use the term levered investment thesis to describe a scenario where a series of investment themes are pyramided on some central truism (which could be implicit or explicit). In 2007, the incorrect assumption was that home prices could never simultaneously decline on a nationwide basis. The internet bubble overestimated the impact of internet (which is amazing to think of given just how profound of an impact it has had). Before that, the emerging markets failed to emerge; portfolio insurance fooled market participants into believing it was foolproof protection against a crash; you catch my drift. So what’s the levered investment thesis in today markets? Well, if you’ve been reading this blog, you’ll know that my nomination is: that the direct central bank involvement in financial markets via quantitative easing (QE) has been beneficial. I believe otherwise, that QE has been destructive for long-term growth and a destabilizing factor in markets (see here and here for more). Thus, those thesis related investments could go wrong. It is my opinion that the enormity of asset inflation created by the various QE programs has created a scarcity of investment returns. This has likely led to the creation and proliferation of various market structures and forces that otherwise would not have existed. The breakdown of these kinds of investments could be the forewarning of a larger move to come. Are we currently witnessing such an event? Central banks have been “hoovering up” a material portion of the bond market, playing a part in driving yields to historic lows. Bitcoin has been embraced as a monetary alternative for those skeptical of the centralized financial system, exponentially growing before their eyes. Retail and institutional investors alike have been pushed further out on the risk spectrum (by design) in search of adequate yields for their liability streams. Legitimate growth stories, such as cannabis (in my view), have attracted outsized investor attention as there’s simply less growth to go around during this anemic economic recovery. And volatility, a complicated function of all of the above, has become a commonplace investment vehicle for the masses. Please, take none of these comments as a condemnation for these products and vehicles. They all certainly have value and legitimate uses within the proper context. What if today’s context (err, perhaps yesterday’s), is in fact a false one? That the emergency actions crafted in the throes of crisis were in fact the wrong ones. Could this explain why we’re witnessing the systematic bursting of these aforementioned mini-bubbles? Or is it all just noise without any connection? Looking back at the housing bubble, there were plenty of glimpses of the levered thesis breaking down before its collapse. Remember, the crisis truly took hold in October of 2008. In early 2007 we saw the credit worthiness of the AAA-rated financial guarantors (MBIA, Ambac, and FGIC for example) come into question. Next, such obscure acronyms as SIVs (structured investment vehicles) and ABCP (asset backed commercial paper) littered the pages of the Wall Street Journal in a negative way. Shortly after, Bear Sterns was gone, followed by Countrywide Financial, Wachovia, Fannie Mae, Freddie Mac, Lehman Brothers, and Merrill Lynch. Then, equity markets collapsed, and the world was finally thrown into crisis. The dam cracked slowly, and then it suddenly crumbled. Are we witnessing the formation of cracks in the levered “central banks saved us” thesis dam? From today’s perspective, “who the heck knows? !” is the only credible answer. Investing is not romantic art, much to my chagrin. What populates the pages of this blog are just guesses; they are my “strong views, held loosely.” Only the passage of time can provide the requisite perspective to put the market’s Monet into focus. 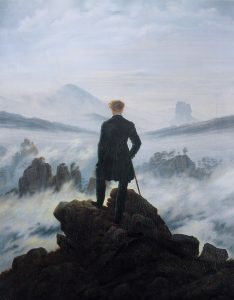 Investing would be a whole lot easier if markets took after Casper David Friedrich instead.